By now it’s no news that the military is facing serious cuts. The Marine Corps alone will drop 20,000 over the next five years. But just how leaders will make those cuts has been a mystery — until now. 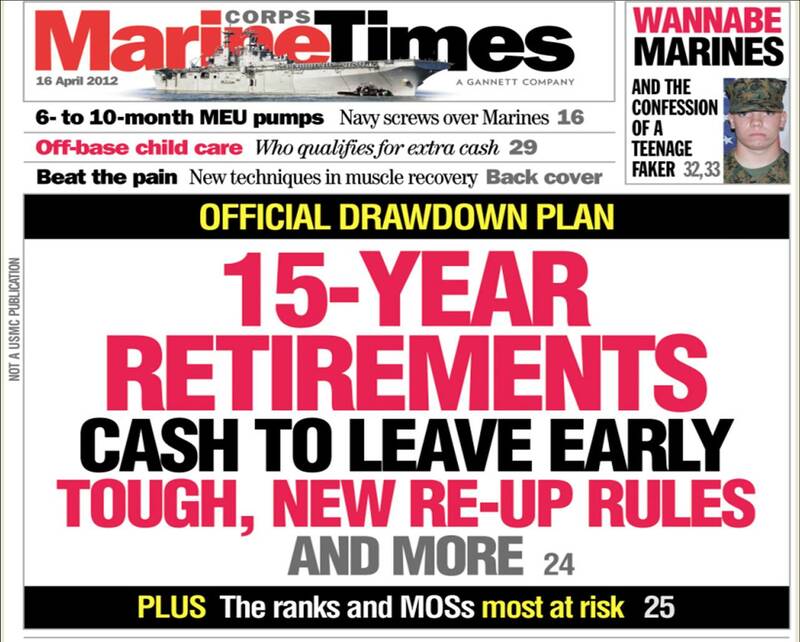 To get the lowdown on how the Marine Corps will drawdown by 2016, and what the plan means for you, check out this week’s edition of Marine Corps Times. For our cover story, we traveled to Camp Lejeune, N.C., to sit in on a briefing by the drawdown’s architects who are now on an eight-week tour of the fleet. In it, we learned what cash incentives are up for grabs, how it will effect re-up and promotion opportunities, and what MOSs and ranks are most at risk. Also in this week’s issue is a pair of great faker stories by staff writer Gina Cavallaro. The first is about a Pennsylvania man who claims to be a Marine first sergeant. Even his brother has called him out, but he was still able to dupe a Canadian soldier who started a foundation for Afghanistan veterans grappling with PTSD. The second revisits the case of Skyler Whalen. He once claimed to be a gunny, but has now moved on to impersonating a police officer. Pick up Marine Corps Times on newsstands now or click here to subscribe.